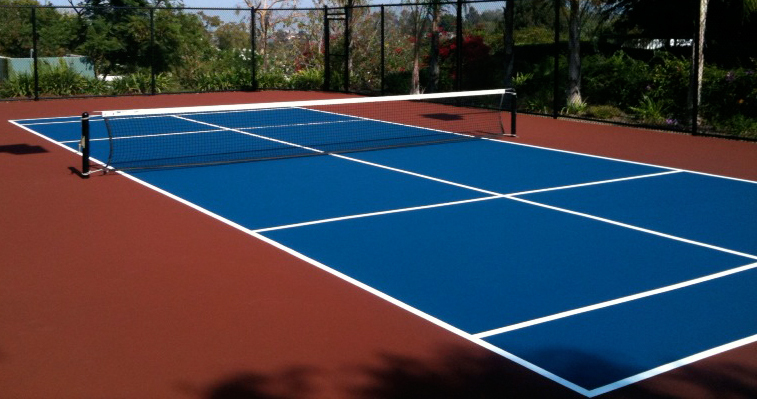 Taylor Tennis Courts is a leader in the game court construction business in Southern California. Whether you need a tennis court to a multi-use sports court let Taylor Tennis Courts make your vision a reality. Satisfy all the athletes in your family with a multi-sport court built by Taylor Tennis Courts. You don’t need a separate court for each sport. We can design a multi-use court that will include court lines for all the sports you enjoy. A multi-sport court helps you maximize the usable space in your yard. We can design any combination of sports you would like: volleyball and ½ court basketball; paddle tennis and pickleball; tennis and volleyball, whatever you enjoy playing. We can customize your court to fit any needs, yard, and any budget. Make your yard the center of activity with a multi-sport court by Taylor Tennis Courts. The inventor of volleyball wanted the game to be a combination of basketball, baseball, tennis, and handball. The first game used a tennis net raised over 6 feet high. Volleyball is now played around the world. Adding a family fun space to your backyard or putting in several outdoor volleyball courts, Taylor Tennis Courts can build courts to fit your needs. With a concrete base, we can install a rubber layer to absorb the impact of play. We offer several choices of surface layers from which you can choose. We can customize surface type, color and materials to meet your needs. Backyard volleyball courts can provide hours of fun and practice for your family and student athletes. If your needs are for several courts, Taylor Tennis Courts can provide plans and execute them expertly to your project needs. Give us the chance to design and build state of the art volleyball courts for you. The game of Paddle Tennis looks like ping-pong and tennis combined. The court is a smaller version of a tennis court and the rules are the same as rules in tennis. The racquets look like large ping-pong paddles. Strokes, grips, scoring and strategy in paddle tennis are the same as tennis. The paddle tennis ball is a regular pressurized tennis ball that has its internal pressure reduced by being punctured, some say the ball has been “deadened”. The court surface should provide the same action as a regular tennis court. Taylor Tennis Courts can design, build and surface whatever kind of paddle tennis court you are looking for. 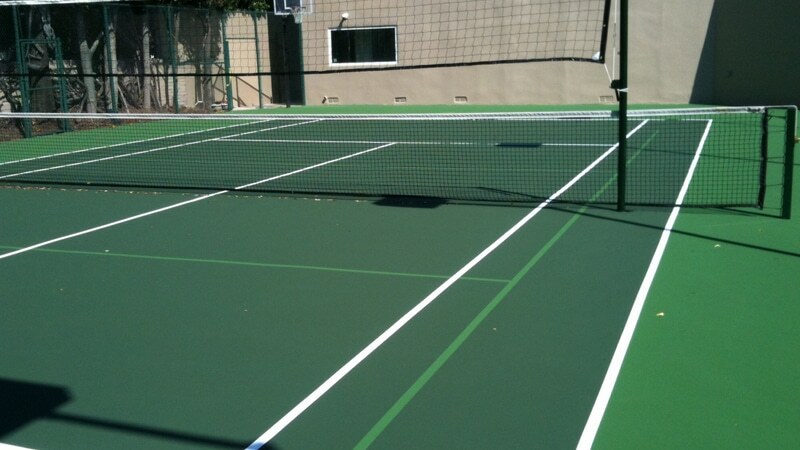 We have built some of the most famous paddle tennis complexes in Southern California. Put our expertise to work, let us build a court for you. The game of Shuffleboard is over 500 years old. In fact, there is proof that King Henry the Eighth of England played and gambled on the outcome of a game of Shuffleboard. He prohibited commoners from playing this game he was fond of. It is played with a cue or stick that sends a weighted disk sliding along a court to marked scoring zones on the playing surface. It can be played by two players or a small team. The game is low impact and can be enjoyed by all ages. The court surface needs to be consistently smooth and flat to enable the unimpeded glide of the weighted disk. Your outdoor court must also be durable to withstand weather conditions, hot, cold and wet. The court does not need to be large and can fit into that unused strip of land in your backyard. Let us design and engineer your backyard shuffleboard court. We will take care of all the details for you. Join the upper class and play shuffleboard. Give us a call, Taylor Tennis Courts for all your athletic court needs. We will give you value as well as quality. Roller Hockey is played in over 60 countries around the world. It was a demonstration sport in the Summer Olympics in 1992 in Barcelona. With its fast-paced action and body checking it resembles ice hockey. With the use of skates, it can be played on a smooth dry surface. The court surface needs to give enough traction for a fast skating surface, yet smooth enough for the glide of the puck. The court should also absorb the shock to players from body checking and the fast pace of the action. Taylor Tennis Courts can provide the roller hockey court that will give you high performance with durability. We pay attention to every detail of your project, from every aspect of construction including fencing, lighting, windscreens, nets and more.